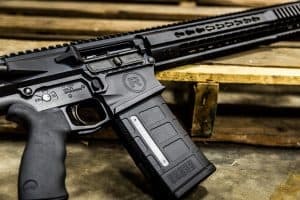 Under the current political climate there has been a mini-run on AR-15 clones, M4geries, or what we like to call Modern Sporting Rifles or MSRs. 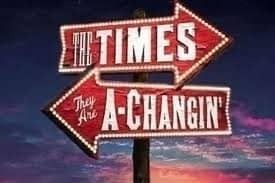 This has in no way been like it was in 2008, but online sources of high capacity magazines, recent gun show prices, and general availability is quite a bit tighter this Spring than it was throughout last Summer and this Winter. There are many reasons that MSRs are so incredibly popular. They are very functional. They are very customizable, having been described as adult Legos. They are easy for young, old, small, tall, big, or short people to shoot well. They are adjustable. Their standard ammo is inexpensive. They are economical, versatile, accurate, reliable, and durable. They are good for youth shooters, they are very popular with women shooters, they are good for plinking, varmints, and protection. They are simply good all around rifles that is probably why they are the #1 selling rifle in the USA. The only downside is that they are feared by many people because of their (good) looks. There is a very strong case that every red blooded American should have one (or 4). There are so many manufacturers, styles, and variations to them that it can be bewildering for those who are new to them. 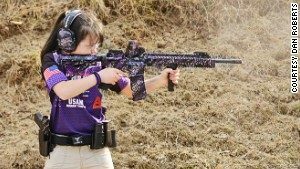 Which brings us to our purpose: Understanding the lingo and what to look for when buying a new AR. AR stands for Armalite Rifle. Not Assault Rifle. The basic design was developed by Eugene Stoner. Stoner knew two things very well: Aircraft and Guns. He used his knowledge of the former to influence his designs on the latter and developed the rifle which eventually was purchased by the Air Force and later all branches of US Service by the mid 1960’s; which the military then designated as the M16. 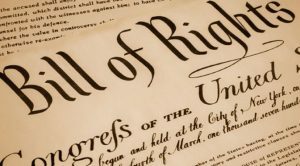 Colt had the rights to the civilian AR-15 until 1977 (and owns the trademarked name AR-15) and when the patents ran out it opened the door to other manufacturers. They were banned, in a particularly bad case of hoplophobia, from 1994 to 2004 which increased their desirability after 2004 to stratospheric levels. Are they Military Style Assault Weapons? 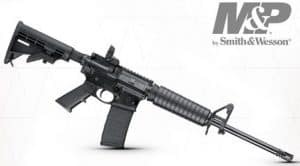 The AR-15 differs from the military M16 and M4 (the current service rifle) in several respects, but the most important is that the military grade hardware is Select Fire, meaning it has full auto capability, or at least 3 round burst capability. Since 1934 it has been generally illegal for civilians to have military grade small arms, so while MSRs look like their military cousins, and share some parts, they do not operate like them. Assault Weapon is a political term that means whatever the users want it to mean, and it usually means a lot of nonsense. They do share some design features with military rifles as do every other rifle ever manufactured to varying degrees. Mostly what the media decries as “military style” are cosmetic & ergonomic features, and a color. You can paint your truck like Bigfoot but that doesn’t make it a Monster Truck. But if you are new to buying one of these icons of Americana then there is a lot of lingo that gets thrown about. This lengthy article should help, and each section contains the bottom line for the “too long, didn’t read” folks. Direct Gas Impingement vs Piston Driven? 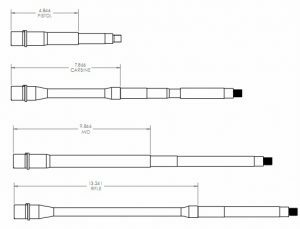 Standard AR15 designs use expanding gas from discharging a cartridge and reroute some of it down a gas tube and back into the chamber to cycle the action and ready the weapon for firing after a subsequent trigger press. This is a perfectly durable, reliable design. In fact, it is the original design and still the one with most widespread use. It is also less expensive than the alternative , using the gas to drive a small piston which accomplishes the same feat. 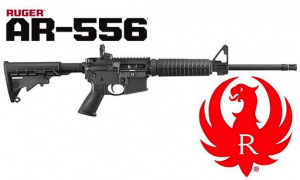 The “piston” guns, like the Ruger SR556 are a little heavier & more expensive (roughly 2x). They do run a little cleaner because no combustion gasses enter the rifle action after firing, which is what makes them desirable. The downside to the direct gas impingement gun design is it is dirtier. But this is not as big a deal for the average shooter as it is often made out to be. Many of us enjoy cleaning our guns after a day at the range, most of us are not under fire or threat of fire while cleaning our guns, and so it is fine. Direct impingement systems are totally fine. If you don’t mind the weight, and have the cash, go ahead and get a piston gun if that interests you. The length of the gas system of a direct impingement MSR influences the cycling characteristics of the rifle. Generally there are 4 lengths: Pistol, Carbine, Mid, and Rifle. 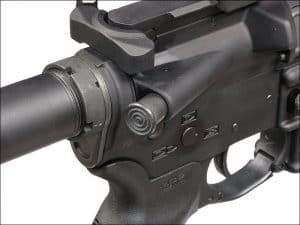 Shorter gas systems are a bit dirtier, and also may increase perceived recoil and wear on the bolt carrier and associated hardware, but they are necessary with SBRs, AR Pistols, and guns that shoot suppressed. Longer gas systems are perhaps slightly more reliable and a little cleaner running. The General Consensus(™) by the Tribal Elders(™) is that the original design used a Rifle length gas tube and a 20 inch barrel and that this is the most reliable. 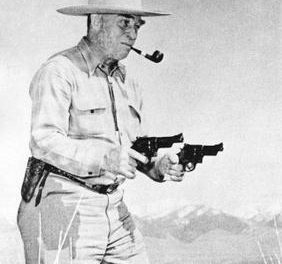 But most of the Tribal Elders(™) also prefer a barrel length around 16 or 18 inches these days, which requires a Carbine or Mid length gas system. Standard for most big name manufacturers is currently a 16” barrel with a Carbine gas system, and this seems to work just fine for almost all situations. This information is good to know if you are buying aftermarket accessories or are building your own MSR. The handguard, barrel, gas tube, and buffers need to match. Operators who like to operate at the highest operationally operative levels of the operation strongly prefer the Mid Length Gas systems. Really, for the rest of us, either carbine or mid length seems fine. 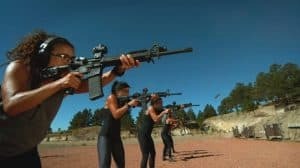 We are learning that longer barrels do not necessarily increase actual accuracy, what they do is increase velocity (up to a point), which can make a rifle more effective at extended range. How much velocity? An 18” barrel will probably gain 200fps over a 16, and a 20” about 200fps over an 18”; after that the gains taper off rapidly. A shorter barrel is a stiffer barrel, which actually helps accuracy. There is a balancing act. Again, 16” seems fine for the standard chamberings, and makes the rifle a little easier to handle, especially indoors. An 18” or longer barrel is usually better for longer range shooting, but a .223 is about a 300-400 yard effective round so there doesn’t seem to be a need for a longer barrel necessarily. For comparison, a .243 has roughly the same energy at 300 yards as a .223 has at the muzzle ( the old .30-30 has more oomph at 100 yards than the .223 has at the muzzle); a .223 is not a great deer gun. A barrel length of 16-18” is pretty standard. A general duty AR’s can use a 16” barrel with good effect out to about 400 yards. This refers to rate of twist of the rifling in the barrel. There is a balance and a tradeoff; lighter bullets can be over revved with too fast a twist rate, heavier bullets can be inaccurate with too slow a twist rate. Any of the common twist rates will work with most any common (standard) bullet weight out to around 300 yards. Heavier bullets are better for long range shooting because they buck the wind better. Smaller bullets are more economical and fun to shoot varmints with. History Time: The original military specification called for a 55 grain bullets so the rifle twist rate was calculated at 1:14″. This was later tightened to 1:12″ for longer range shooting, which works very well with bullets weighing 40-60 grains (the normal and historical .22 centerfire bullet weight range). Several years later, the military desired more penetration, so they increased the issued bullet weight to 62-77 grains. The original standard 1:12″ twist could not properly stabilize these heavy bullets, so the spec was changed to 1:7″ twist, which will stabilize bullets weighing 62-77 grains. Most manufacturers of AR-15 type civilian rifles now do the same. Unfortunately, 1:7″ is too fast for frangible varmint bullets, so now we have two “standard” twist rates for .223 rifles: 1:12″ for varmint rifles (typically bolt guns) and 1:7″ for AR type rifles (except now we also see a lot of 1:8” and some 1:9”, as bullet weight research continues). If you want to shoot prairie dogs or try your hand at bullseye competition you may have specialized needs. Otherwise 1:7”, 1:8”, or 1:9” are all ok.
40 1:12 Generally a prairie dog varminting bullet (expect explosive expansion). 55 1:9 The general standard bullet for general use, and can be used with 1:7 twist just fine. 62 1:8 or 1:7 Sometimes called “penetrators” but they also work well at slightly longer ranges. The military uses 1:7” with a 62 gr bullet. Most commercial AR’s come with a forward assist button. By smacking this button you can force the bolt carrier forward if a cartridge does not seat properly. This is somewhat controversial. After an incredible amount of study, it must be concluded that they are helpful in very few situations. This item should not be a deal breaker by itself. At any rate almost all uppers have this as standard. This is almost always used in reference to the “gas key”. The gas key is what engages the gas tube to allow the gas to push the bolt carrier rearward when the gun is fired. When the gas key is attached to the bolt carrier some shoddy manufacturers (theoretically) do not properly stake the screw heads. Staking is when after tightening a screw a sharp punch is struck with a hammer to slightly smack the steel near the screw head pinching the metal to prevent the screws from working loose. Important but very few manufacturers these days skimp on it. The Shell Deflector is a little nubbin that juts out just rearward of the ejection port that deflects spent casing away from your face. Almost all uppers have these, they are good to have, and if you are a Leftie you NEED one. The dust cover is snapped shut for storage or carrying long distances and prevents debris from getting in the chamber, it flips open upon firing or cycling the action manually. In non-desert or swamp/wading conditions it is probably unnecessary, but always nice to have. Good to have, most already do. Mil Spec is a somewhat misleading and misused term which stands for Military Specification. No civilian rifle truly meets Mil Spec because if it did it would be a military rifle. What it is generally taken to mean is that the part in question meets the general specification of the military standard. 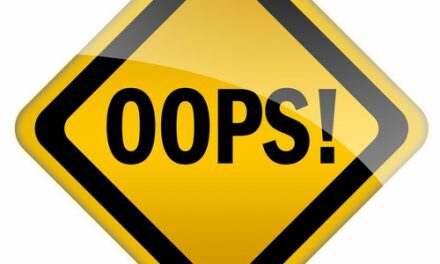 It is often overused, and therefore means less than it should, but if a manufacturer claims something is mil spec they are attesting that it is standard quality and non proprietary. This is in opposition to commercial parts and proprietary parts. If a manufacturer claims something is mil spec they are generally attesting that it is standard quality and non proprietary. The truth of these claims should be based on their reputation as a manufacturer. Type III (hardcoat) is an anodizing (electrolytic) process that forms an extremely hard, abrasion resistant, porous oxide on aluminum. This is the standard finish for Upper, Lowers, and other Aluminum parts. Chromoly – chromium-molybdenum alloy steel, a good tool steel and what many good barrels are made of; it will rust if not maintained. These may be Nitrided (inside and outside), Blued, Parkerized, Cerakoted (outside), or Chrome lined (inside). 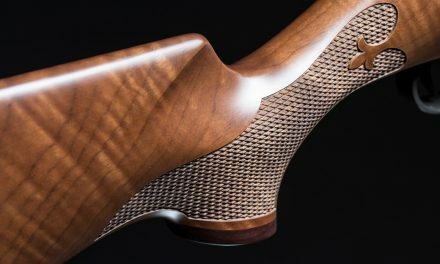 Chrome Lining – Chrome-lining protects the barrel from corrosion and is also easier to clean, but the main purpose for lining a barrel is to increase the barrel life. However, a good non chrome-lined barrel can last for over 5,000 rounds before it begins to show a loss of accuracy. Nitriding– (Tennifer, Melonite, Ni-Corr, Black Nitride, or Salt Bath Nitride, FNC, QPQ) a process where a hot metal surface is quenched in a molten chemical solution or “salt bath” resulting in a two-part surface layer — an iron nitrate layer and a nitrogen diffusion layer that gives a hardened surface without hardening the core.The process is much more corrosion-resistant than hard chrome and can be applied to the inside or outside of steel components. Stainless steel is an alloy of steel and – usually – chromium, which keeps oxygen out by forming a thin layer of chemically passive chromium oxide on the surface, meaning it generally doesn’t react with anything else, especially air and water. Stainless steel barrels can still be chrome lined or cerakoted externally if that is your thing. Gun Blue -a process where a steel (even stainless) part is subjected to an electrochemical process forming a surface coating of a black oxide of iron this is corrosion resistant and helps with wear. Cerakote – (Duracote and others) are proprietary hi tech paints containing things such as ceramic particles. This creates a hard surface that resists heat,corrosion, scratching and other abrasion, such as if the gun is dropped or otherwise impacted by something. They do increase the thickness of parts they are applied to and cannot be used on internal components. Chrome lining the gas key and bolt are standard, and desirable. Unlined/untreated barrels can be had inexpensively. The downside is they may rust/erode. However, the cost of entry with an unlined barrel and the cost of replacement after a few years of use make the point somewhat moot for the hobby user. Gun Bluing is standard for gun steels, Nitriding is more desirable, cerakote looks cooler. The cost/benefit ratio is probably best with a nitrided / melonited barrel. But the average shooter will be fine with any good quality barrel. Heavy/Bull/Target barrel – heavy, and expensive, good for prolonged range sessions. Depends; most give preference to Full Profile or Pencil. .223 chamber: should fire only .223. Your barrel probably won’t explosively rupture in your face from shooting a 5.56, but do what you want, it’s your face. .223 Wylde a hybrid chambering that can fire either, with better theoretical accuracy over shooting .223 out of a 5.56 chamber..This is usually a more expensive or custom rifle. Add to this probably a dozen other chamberings with completely different calibers, but that is beyond this article. Most common MSRs are chambered 5.56 and this is fine to shoot 5.56 and .223 ammo, not the other way around. Forging is when a semi molten blank of metal is pressed into a shape by a very large press or hammer. This results in a generally consistent product that has the added benefit of increasing the materials durability. The downside is some of the angles and edges will not be as crisp, basically fine details are not very fine. A billet product is machined (on a CNC mill these days) out of a big chunk of material. It is basically carved out. This can result in a very high end finish with lots of detail, but they are never as strong as forged, also they are MUCH more expensive. Do you want to look at it or shoot it? Go with Forged, it is stronger anyway, if it isn’t a show piece and you have a budget. What Material for Upper or Lower? Between the metal receivers there are two popular aluminium: 6061-T6 and 7075-T6. The 7075-T6 is twice as strong as the 6061-T6 aluminium. That being said, it is obviously a little more expensive than the 6061-T6. The qualities of polymer that make it attractive is its’ lightweight and lower purchase price. Reviews indicate that it is acceptable. M4 vs standard feed ramps? The barrel extension, the part of the barrel that fits into the Upper Receiver, has feed ramps built into it. 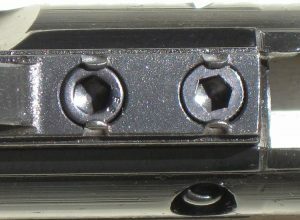 When the bolt pushes a new round towards the chamber, the bullet tip hits the feed ramp and gets guided into the chamber. The cuts of the M4 feed ramps extend beyond the end of the barrel extension into the upper receiver. By extending the feed ramps further, potential feeding problems are improved. 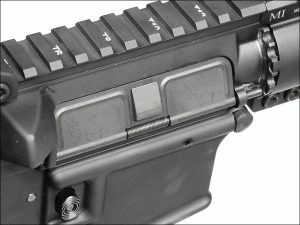 Most current AR15 components are equipped with M4 feed ramps as a standard. If you are building your own you need to be sure that your upper and your barrel extension match, either both standard, or both M4 style. The M4 is more desirable, but not a deal breaker, mostly make sure the barrel and the upper match. A D.I. gun with a carbine length gas system, chrome lined gas key and Carpenter 158 or 9310 steel Bolt and BCG (phosphated or nitrided preferably) with properly staked screws on a forged 7075, A3 style, Type III Hardcoat Anodized M4 Upper with brass deflector and dust cover, picatinny rail, and Mil Spec Forged Type III Hardcoat Lower with A2 GI Trigger (fire control group), 6 position stock, 16” Nitrided barrel with M4 Feed Ramps cut into the barrel extension and an A2 style flash hider is pretty much the standard. Different manufacturers make trade-offs in certain areas in order to deliver to a price point and some of these specs are more important to an individual than others. Full and Complete Disclosure, before that horrific kayaking incident (Curse Davy Jones’ Beard) on Center Creek I had 4 ARs. 3.25 of them were purchased from the fine folks at my favorite local ballistic arts emporium. I had (before Poseidon took them to a watery grave) a Radical in .300 Blk; a Ruger AR-556 (below left); an S&W M&P Sport II (below Right); and a DIY one made from an Anderson lower (a Liberty Tree purchase on their anniversary sale) and a PSA upper. They were all (prior to that eventful day on the creek) good shooting guns. Obviously the three that are were not a roll-your-own affair had slightly better fit and finish. But they are were more capable than I am. This lengthy post has just been intended to help understand what is out there. As always Eli, Keith, Bill, Vanessa and the rest of the fine folks at Liberty Tree would love to help. They stock quality options at several price points.